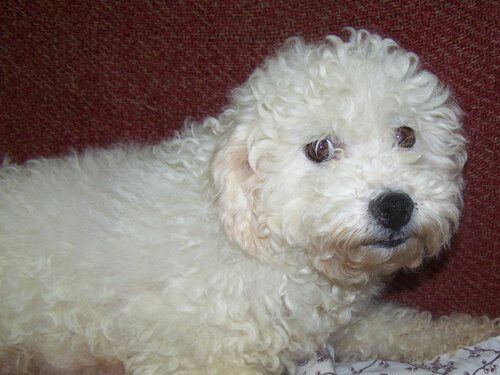 A Cockabichon is a hybrid that is a cross-breed of a Cocker Spaniel and a Bichon Frise and may demonstrate any combination of traits from those two breeds. Hybrids have become very popular in the past few years. They play a big role in the current designer dog trend. The experimentation of these hybrid or designer dogs has not been recognized by the American Kennel Club or Canadian Kennel Club. The key to cross breeding to purebred dogs is what is called hybrid vigor, the breeding resulting in a healthier dog with superior genetic constitution can come from dogs purebred for so long that they have common genetic disorders. The Cockabichon is a charming, gentle dog that is not a yapper. They have an independent spirit, are intelligent, affectionate, bold and lively. It has a self-assured, happy temperament that is easy to live with. They are gentle and trusting, with average intelligence. This breed is lively, playful and devoted, but should be socialized well when they are young to avoid a tendency for timidity. Cockabichons love everyone and need people to be happy. They can be difficult to housebreak but with a steady regiment will be able to learn from a good master. Cockabichons have short and fine fur on their head, medium length on body, with enough undercoat to give protection. Long and loosely curling. They should be groomed frequently and bathed every month, moreover professional grooming is recommended every 4 weeks. The body of the pet dogs may be clipped with electric clippers though the rest of the dog must still be scissored. The Cockabichon sheds little to no hair and is good for allergy suffers. Some common health concerns in Cockabichons include luxating patellas, bladder problems, block tear ducts, skin ailments, cancer and autoimmune disease, as well as cataracts and epilepsy. They may also experience a variety of inherited disorders such as eye and ear infections, epilepsy, and hip dysplasia. Most of their exercise needs can be met with just playing, but they do love to walk and romp in open areas. Cockabichons can adapt well to a city dwelling but need sufficient exercise to prevent them from becoming overweight. Daily walks will do fine to keep the pup healthy and in shape. Cockabichons may be difficult to housebreak. They need rules to follow, and limits to what they are and are not allowed to do. They also need a daily pack walk. Cockabichons are trainable and learn quickly, but do not respond well to harsh training. They should be trained with a gentle hand.